This organ is the largest gland in the body, weighing from 10 to 12 lbs. avoirdupois. It occupies the fore part and right side of the abdominal cavity, being situated immediately behind the diaphragm. It is kept in position by strong folds of the peritoneum, which extend from it to the diaphragm and adjoining organs. Its colour is reddish-brown. It is divisible into three principal lobes, of which the left is the largest and the central one the smallest. 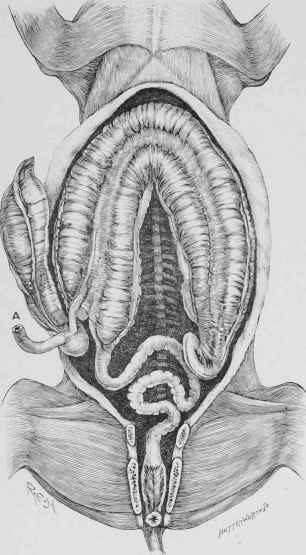 There is, in addition, a small lobule, named the lobulus Spigelii, connected with the posterior face of the right lobe. Fig. 87. - Large Intestine, showing its Position in the Abdomen. For description see Fig. 86. The structure of the liver is highly complex, but it consists essentially of a mass of cells separated by connective tissue into small lobules, which are further defined and isolated by the blood-vessels and bile-ducts which surround them. Fig. 88. - The Liver and Pancreas.